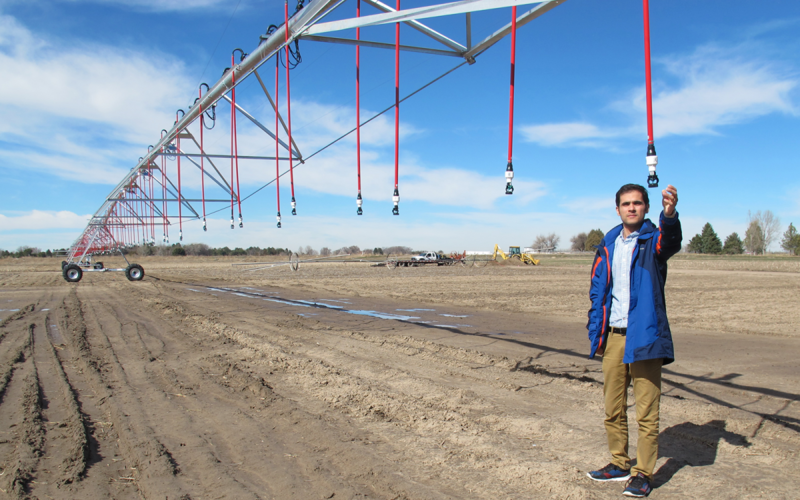 Irrigation water management specialist Amir Haghverdi inspects one of the nozzles on the new, precision, variable-rate linear irrigation system. Nebraska farmland value dropped an average 4% to $3,135 per acresince Feb. 1, 2015, according to preliminary results from the UNL Nebraska Farm Real Estate Market Survey. Rental rates dropped 2%-10% across Nebraska. Decreases in land values ranged from -1% in the northeast and east to -10% in south central Nebraska. UNL Survey Asks: What Weather and Climate Information Do You Need? How can you use climate information to aid crop production? Perhaps in irrigation management? Freeze projections? Fertilizer & herbicide application timing? Pest forecasts? What are you using and what tools do you need? 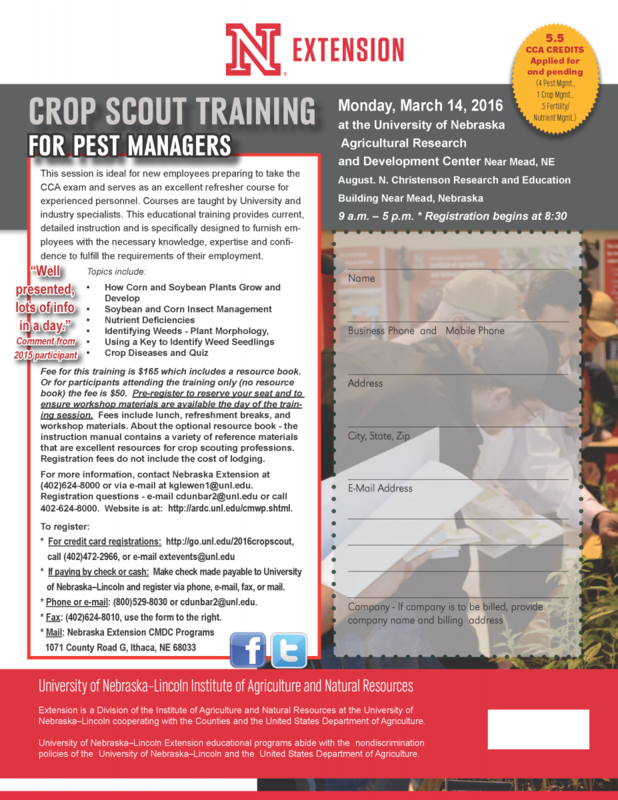 Soybean Growers: Your Help is Needed to Identify Preferred Production Practices. UNL researchers are developing a baseline of practices to aid in identifying yield-limiting factors in Nebraska. Wheat rusts were reported this week in Texas, Louisianna, Arkansas and Okalahoma. Reports mapped at USDA Cereal Rust. A Guide to Planning Annual Forage Systems. With current pasture prices and continued strong demand for summer pasture, some producers are looking at cropland alternatives to produce grazing forage. This looks at factors to consider for managing a systems change and how to examine the economics for your system. 2015 Alfalfa Variety Trial Results. Includes Roundup Ready® 2012 seeding, and irrigated 2013 and 2015 seedings. Nebraska farmers questioned, tested and learned. Can their results help you? Download the Nebraska Extension On-Farm Research Network 2015 Season Results to see what 66 producers participating in 80 studies learned. The National Ag Safety Database is a rich resource for reliable, practical safety and health information. Peruse interesting, user-friendly material now and bookmark it for quick access later.